It is that festive time of year again. But V and I were feeling less than merry. We needed to get out of town for a long weekend and a change of scenery. V, ambitious and adventurous woman that she is, offered suggestions such as flying to Istanbul and Amsterdam. I, being far less ambitious, suggested driving to Munich. The trip from Prague took about four hours. It can be done a quicker with less traffic and a heavier foot on German roads. Living on the east side of Prague adds some time to the drive. 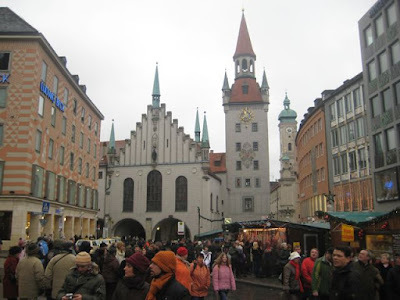 Also, I got lost in the center of Munich, which has inspired me to buy a sat-nav system. The focus of the weekend was food and drink. The first night, we looked into Hofbräuhaus, but it was touristy and insane, so we moved on. We ended up having dinner at Haxnbauer. 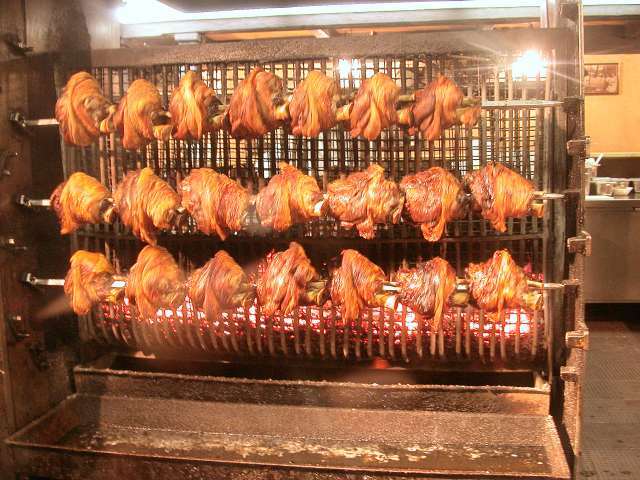 It's also a big, touristy place, but V said she had the best pork knee of her life. You can see them flame roasting on spits in front of flames in the window. Unfortunately, I didn't take any pictures there. I did find a good picture on someone else's site, here. 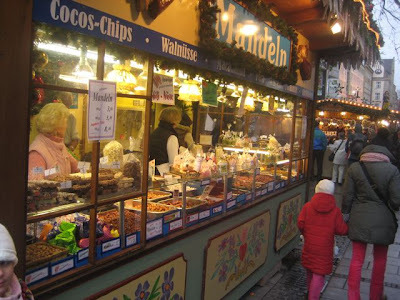 But to make up for it, I took plenty of photos of the endless offerings in the historic center's Christmas market. 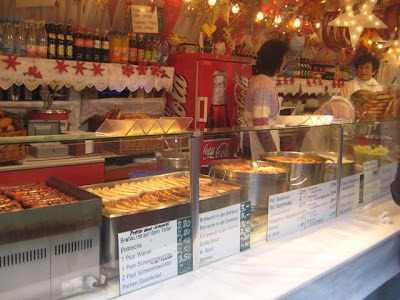 Unlike last year's Prague Christmas Market Food post, this one will not be in verse. 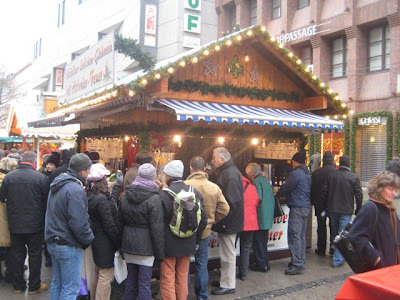 I'd say the most popular stands in Munich were those selling Glühwein, usually for €2.50 The mulled wine was very sweet, with a some fruit and spices like cinnamon mixed in. It was served from heated pots. 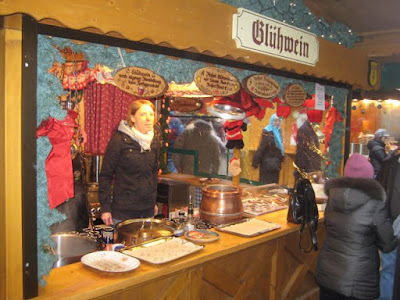 But I saw most of it came from pre-made Glühwein bottles that were poured in. They don't mix up special batches on this scale. Also, it was served in mugs that had a €3.00 deposit, unlike in Prague where the svařák comes in cheap plastic cups. 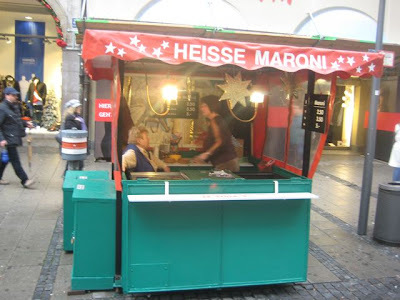 V stopped and got a bag of hot chestnuts, which are called maroni, for €2.50. The price varied slightly from stand to stand. 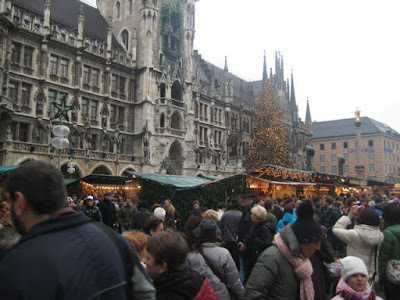 It was very crowded in the market, especially in front of the Rathaus on the Marienplatz. It was not easy to move quickly through the masses. Next in popularity were the many types of sausages. It seemed like the long red thin ones on buns, what I'd call a "foot long", were everywhere. Very hot dog-like. Don't give me a hard time for not knowing the name in German. 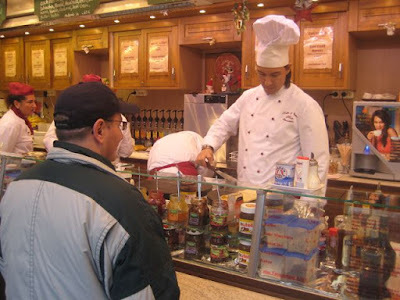 There were a number of things I wasn't too familiar with, not being an expert on German food. 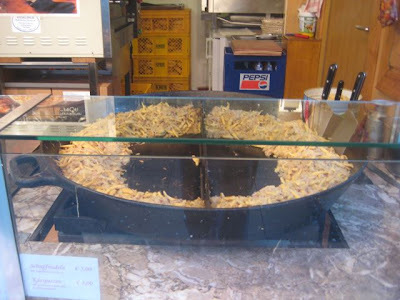 There was something called schupfnudeln for €5.00. It's sort of a Bavarian potato gnocchi with sauerkraut. 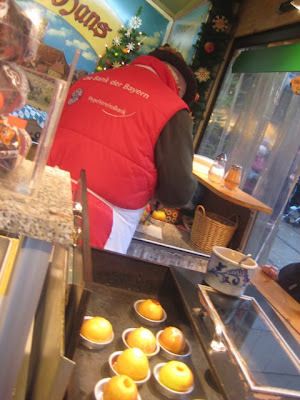 I saw baked apples with what looked like sugar bubbling out of the center. 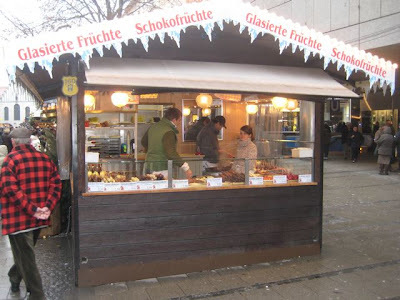 There were stands selling fresh fruit, freshly dipped in chocolate. The smell of almonds cooked with sugar was just about everywhere. I loved it when we first got there. But by the end, it was beginning to be too much. At a chocolates stand, I found one of my all-time favorite treats. 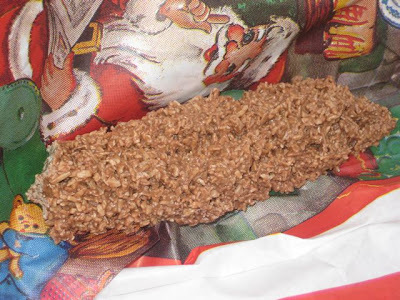 Milk chocolate covered toasted coconut. One long piece cost €2.50. I bought five. The stuff is the closest thing to crack for me. By the time we got home, I was regretting that I didn't buy at least 10. 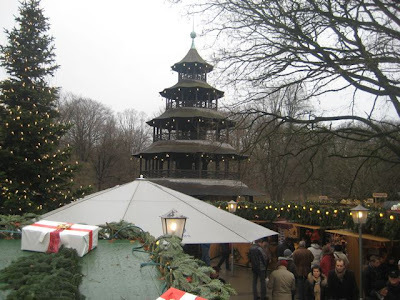 We had a nice walk through the English Garden and saw the Christmas market at the Chinese Tower. In the restaurant in the house there, we had a snack of beef carpaccio and mushroom soup and weizenbier. It was great. A nice, peaceful break from the cold. 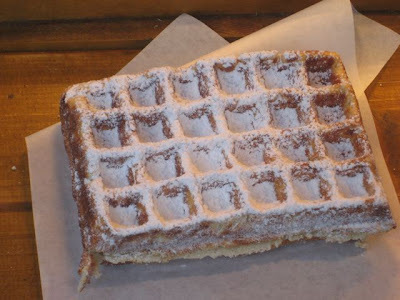 From the market outside, I had a fresh-cooked waffle with powdered sugar. It was pretty bad, actually. Almost burnt on the outside and undercooked on the inside. I think it was a steep €3.00. 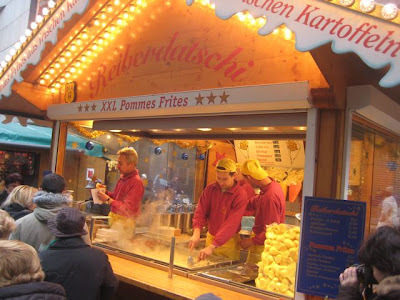 Back around Marienplatz, they were selling crepes with a multitude of fillings. The potato shack was a big favorite. They had fries, but also potato pancakes. 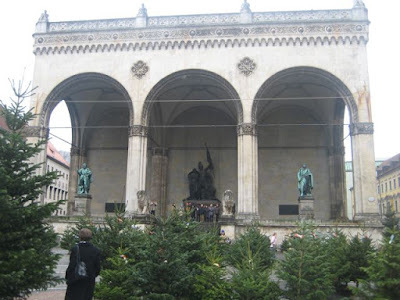 One of the last things we got in Munich was a Christmas tree. We bought a cute, full-branched, medium-sized one for €25.00. On our last night, we couldn't eat any more pork or cabbage. We found a place with all-you-can-eat running sushi for €12.00 per person. Despite its non-traditional nature, the dinner brought us great cheer before we loaded up our sled and headed back to Prague. Nice post. I can't get enough of thoses sausages and sugared nuts, either. 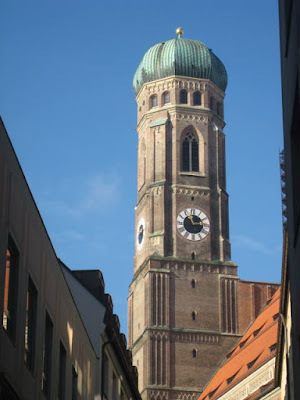 By the way, I also became horribly lost in central Munich last year trying to find my hotel, and have now purchased a GPS gizmo for my car. It's one of the best investments I've ever made. A magic device. I was too full of Christmas food (or sushi) to consider Whoppers for most of the weekend. 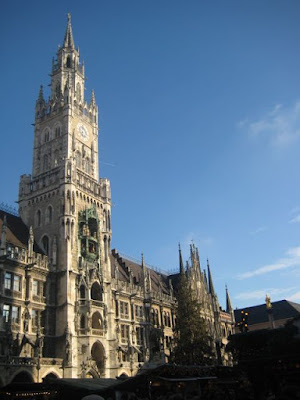 I actually hoped to stop at a German BK on the highway out of Munich (for purposes of scientific comparison, mind you). But the detour was vetoed by the navigator. good post and lovely pictures. 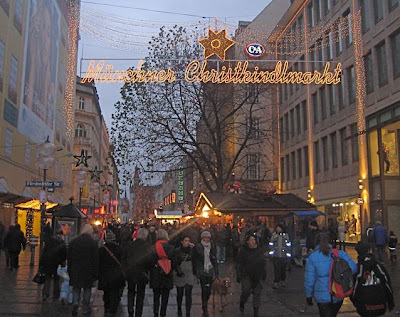 I was hoping to go to the Munich christmas markets or Oktoberfest, I have managed to go to none of them. Maybe next year its better!